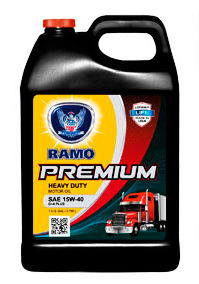 RAMO PREMIUM SAE 15W-40 provide excellent protection against wear, long life performance, soot reduction and fuel economy. Value Tech Extra Duty Motor Oils are specifically designed to withstand the rigorous requirements of exhaust gas recirculation (EGR) engines. Special formulation and advanced additive chemistry provides long lasting protection for both turbocharged and naturally aspirated diesel and gasoline engines. This high performance ois is specifically engineered to meet the manufacturers’ prerequisite for performance, TBN, and balanced low ash requirements. It is formulated for extended service/extended drain when operated under typical operating conditions and is engineered to help promote fuel economy. JASO DH-1, and are engineered to meet Caterpillar, Cummins, DaimlerChrysler (Mercedes Benz), Detroit Diesel, Mack (including Mack EO-N Premium Plus 03), MAN, Navistar and Volvo.